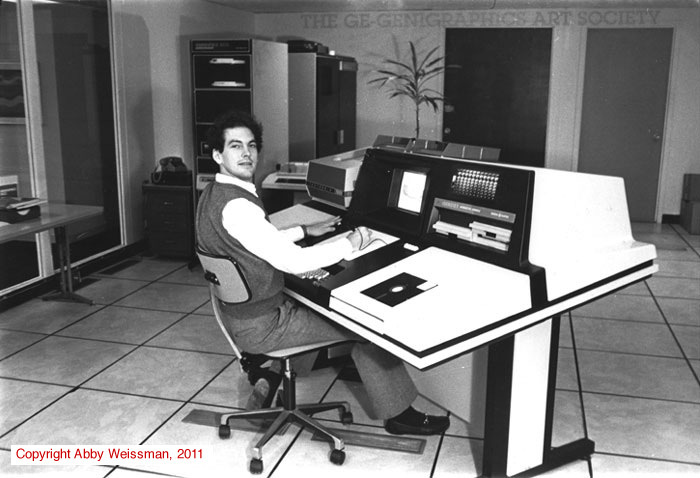 The GENIGRAPHICS 100B INTERACTIVE WORKSTATION, circa 1981. Operated by Preston Stuart of National Imagemakers, NYC. Photo by Abby Weissman, 1981. The GE-Genigraphics Society was created for the enjoyment and appreciation of all former employees of the Genigraphics Corporation, as well as for employees of the many companies that utilized Genigraphics equipment – and anyone with an interest in the early years of the computer graphics industry. Former Genigraphics artists and employees worldwide are encouraged to join the G.P.S. to connect with others and document their experiences from this first generation of computer graphics workers. This site is dedicated to all the employees of the original Genigraphics Corporation and all Genigraphics artists worldwide. Join us to share your passion for computer graphics and commemorate the company that helped start the graphics technology revolution. All original artwork and images copyright The GE-Genigraphics Art Society, 2011, unless otherwise noted. Cannot be reproduced without permission. All rights reserved.